Tonight we are going to review a crémant wine – that delicious and fizzy wine style that is so popular in every corner of the world. This one is made by the modern, or should we say alternative, méthode charmat, exactly the same way as original prosecco is being made in Italy, the only difference is that it is made of chardonnay and pinot blanc grape varieties, rather than glera grapes, which are used in Prosecco wines. 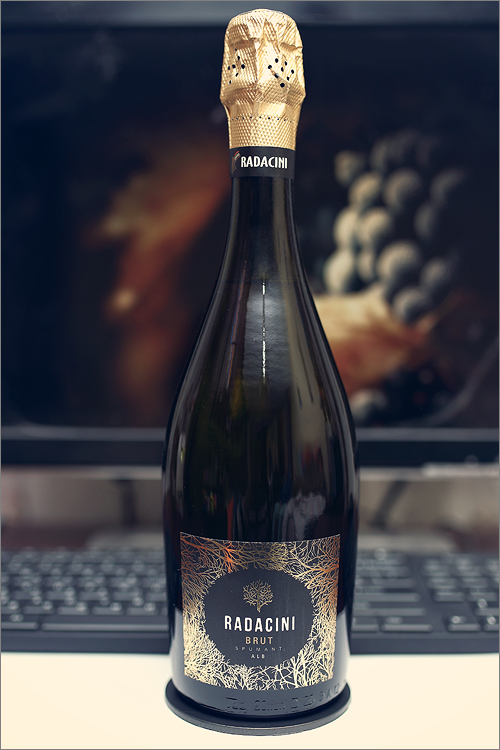 Without any further ado, the wine we are going to review tonight is Spumant Brut Alb from Radacini. Brilliant green color with shades of straw-white towards the rim. The nose is rich, filled mostly with sweet fruit: lime, green apple, green bell pepper, green pear, arugula, green grass, gooseberry, nettle, kiwi, celery, dried apricot and some nuanced hints of limestone. The wine is demi-sweet, with high alcohol level, high acidity and medium tannin. It tastes syrup-like: smooth, oily and round. This is a very wide wine – a bit zesty, but quite flat overall, lacking structure and character. The wine has a poor overall balance, as it feels too sweet for a brut style crémant wine and is quite flabby overall. The wine has a medium finish and an unbalanced-sweet aftertaste. This is definitely a fair Wine of Moldova and the overall rating says the same, with 87.5 points scored it is right there, among the best wines we’ve tasted so far. Please click on the chart icon on the left in order to get to the wine rating page, where you can find all the wines we’ve tasted to date. Conclusion: this wine is quite delicate to rate, as this is not the regular brut style crémant wine: it is too sweet, unbalanced kind of sweet, as a result, it does lack structure and character, and it feels quite flabby overall. We could not recommend this wine to those who seek a nice brut crémant wine, but we would recommend to pair this one with light desserts and fresh sweet fruits, like for example some vanilla bean panna cotta or a summer fruit salad.